What was the reason behind developing PALLAS? PALLAS is the world’s very first ultraviolet (UV) laser indicated for treatment of dermatological conditions. It obtained FDA approval for the 307nm and 308nm wavelengths. PALLAS is effective in psoriasis, vitiligo, atopic dermatitis, and alopecia areata. These conditions were initially treated using a UV lamp but it took a year to show results. The excimer laser was developed to bring better outcomes more quickly. 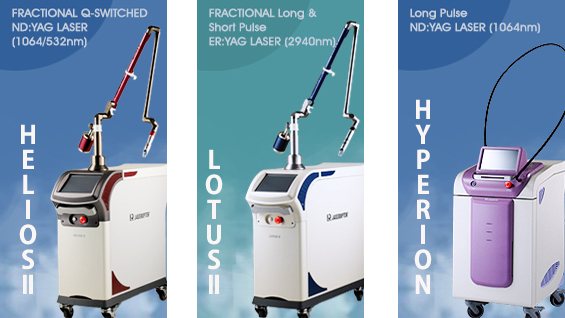 According to literature, lamp treatment in 310-313nm wavelength range is the most effective but excimer laser was able to shorten the treatment period to 3 months with only 308nm wavelength with better outcomes than the UV lamp. It was first introduced in 2000 as a treatment of dermatological conditions and continued to get favorable reviews by clinicians. However, there was one problem with the excimer Laser. It uses xenon and chlorine gases. Gas laser devices require regular exchange of gases to maintain the purity of gas which is critical for laser oscillation. The problem is that the output tends to increase drastically after gas exchange and this can cause side effects. As burns can worsen psoriasis and vitiligo, extra caution is needed using this laser. Another disadvantage is the high cost of exchanging the gas regularly. In general, a one-doctor practice would spend about KRW 20 million and a large hospital would spend three times as much on gas exchange. There are other components that need continuous exchange such as the electrodes, laser mirror, and switch, etc. PALLAS was developed to remove these drawbacks. This solid laser does not use gas and does not incur the cost of continuous replacement of components and produces consistent energy output. The development began in 2007 and it took us seven years to create this innovative new laser. When did you get FDA approval? PALLAS was FDA approved in 2015 and in 2016, Korea’s Health Insurance Review and Assessment Service granted national health insurance coverage for PALLAS in psoriasis and vitiligo. As it can be only used in dermatology in Korea, about 400 practices use PALLAS. As the Korean market was small, we had to turn to the global market and hence the FDA approval. The demand for the treatment of psoriasis and vitiligo is the largest in the United States. We had stability problems in the beginning but we resolved this issue by early 2017 and got FDA approval in the same year.